A curling team led by an Olympic gold medallist has been kicked out of a Canadian tournament for poor behaviour and drunkenness. Ryan Fry, who won gold for Canada at the 2014 Winter Olympics, and his teammates forfeited their final game at the Red Deer Curling Classic in Alberta after fans and opponents complained. The group reportedly broke brooms and damaged locker rooms. In a statement, Fry apologised for his behaviour. He was part of the Canadian curling team that beat Great Britain's curlers in the Sochi 2014 final. "They went out to curl and they were extremely drunk and breaking brooms and swearing," Red Deer Curling Centre facility manager Wade Thurber told Canadian broadcaster CBC. Mr Thurber also said there was "some damage in the locker room". Fry and teammates Jamie Koe, Chris Schille, and DJ Kidby were disqualified as a result. "I wish nothing more than to apologise to everyone individually," Fry said. "I will strive to become a better version of myself while contributing positively to the sport and curling community that I love so much." 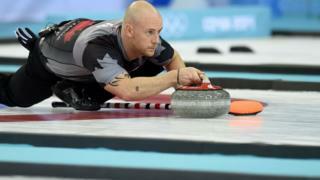 Although he was not taking part, Jamie Koe also issued a statement apologising on behalf of the team. The Red Deer Classic bonspiel, or curling event, is a part of the World Curling Tour. It takes place annually in Red Deer, Alberta, and counts towards rankings of the best curling teams in Canada.